Yesterday – Sunday 4th July I did another Evans Ride It event. My first was a few weeks ago when I did the Dorking Downs Run. The last run I did was the short route, about 30 miles. This run was supposed to be 60 miles which is fairly close to the 80 on the Big Red Ride. If I could do 60 miles then I would be fairly confident that I could do 80. The routes for the Peaks were changed though because of the amount of climbing. The medium route was reduced to 43 miles. I did think that maybe I could do the long route (about 68 miles) but I am very glad I didn’t. For most of the route I wasn’t too bad. I had some energy bars and some energy drink which I think must have helped. Up to about 30 miles I was doing ok. There was LOTS of climbing – but mostly it was long not too steep climbs instead of short very steep climbs. Despite the weather forecast reporting heavy rain I didn’t get rained on at all. The weather did have it’s part to play though and it was INCREDIBLY windy! At the top of one of the 2 huge climbs I actually had to pedal down the other side of the hill just to get to 15 MPH because it was so windy. The wind frequently pushed me off course when it was sideways. The last 10 miles was really tough. 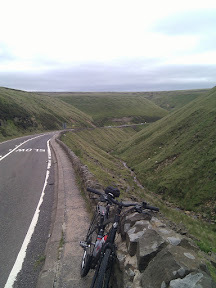 There were a couple of climbs, the first was fairly long but not too steep. The second, in the last 2 miles of the route was short but it was really steep. For the entire 43 miles I didn’t walk at all but I did have to stop about 3 times on that last climb. My legs were very tired at the end of the ride. I was expecting them to be very sore today but they were actually fine. In fact I broke my record for best time cycling into work today and I think I probably broke my record cycling back as well. I wasn’t really trying to go quick, I just didn’t hold back as I was last week in an effort to save my legs. The fact that I was still able to cycle today has made me think that the 80 mile ride will be fine. I would like to do a 60 mile ride between now and then but I am running out of weekends. I’ll see if I feel like it this Saturday but it would be nice to just have a relaxed weekend this time round.